They weren’t always red. Most early schools were made of logs. Clapboard schools were painted white or left unpainted. Some schools were painted red after the Civil War, but people objected to painting schools the same color as barns. A single school term of six to nine months began after the Civil War. Almost every president up to and including Lyndon Baines Johnson attended a one room school. Other notables who attended one room school include Joyce Carol Oates, Alan B. Shepard, Laura Ingalls Wilder and Henry Ford. High schools as we know them today didn't exist until the 1930s. States made an effort to reopen closed schools and encourage young people to attend during the Great Depression as a way of keeping teens out of the workforce so more adults could find jobs. Most teachers were female. They were not allowed to marry and generally boarded with a local family. Female teachers got five or six dollars a month in salary. Men earned fifteen dollars. In the early 1800s the youngest scholars were called A-B-C-darians or abecedarians because they were learning their A-B-Cs. These youngsters sat up front. A teacher’s duties included cutting wood, starting a fire in the potbelly stove and preparing a hot lunch. Prior to McGuffey’s Readers, first published in 1836, parents sent whatever book could be found around the house—usually the Bible. McGuffey’s opened the door for the printing of other textbooks including History of the United States. A popular geography book featured a Chinese peddler selling rats and puppies for the purpose of making pies. Reform was slow. At the turn of the century state educators sent out rural standardization ranking schools on desks, blackboards and outhouses. Speaking of outhouses, did you know that during Colonial and frontier times the crescent moon on the door was used to symbolize womanhood? (The moon or Luna was an ancient symbol for women). Outhouse for boys and men were marked with a star or sunburst. These symbols were originally used to direct non-readers. Male outhouses soon fell in disrepair and were not maintained (which explains why so few of them remain today). It soon became common practice for both men and women to use the “cleaner” crescent moon outhouses. In 1919 there were 190,000 one room, one teacher schoolhouses in the U.S. By 1968 that had dwindled down to 4000. Today there are only a couple hundred left. Hawaii closed its last one room schoolhouse in 2005. What do you most remember about your early school days? 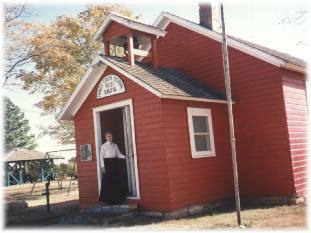 Anyone attend a one room schoolhouse? A bestselling author of more than 40 books, Margaret is a a former Romance Writers of America Rita finalist, and wrote for a CBS daytime soap. 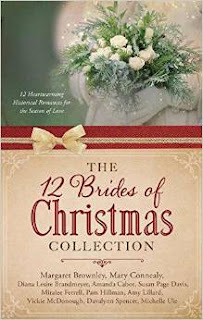 Three of her stories are featured this Christmas season in collections, including the 12 Brides series. Also look for the exciting conclusion to her Undercover Ladies series. CALICO SPY is available for preorder now. Margaret is currently working on a new series. Hi Michele, there's something special about attending a small school, isn't there? I think some kids feel lost on today's large campuses. Your principal was sure ahead of her time. Love it! The elementary school that I attended had several hundred kids in it. I remember the big round water fountain that we gathered around to wash our hands before eating lunch. I can also remember being in fourth grade the day the principal announced that President Kennedy had been killed. Some kids cried and other laughed. It was a vivid experience. One thing fun, I loved riding the small square scooters in PE. Attending a one-room schoolhouse where you knew everyone would have been a neat experience, but I think you'd miss out on things like art, music, and PE. Hi Vickie, thank you for sharing your memories. You're right; you would miss out on some things in a smaller sized school. Unfortunately art and music have almost vanished from some schools here in California. I wonder if this is true in other states? What I like is most one room school houses are on state fair grounds so you get to go inside them. 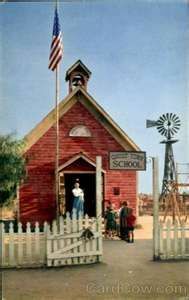 I never did attended a one room school house as I was raise in more of a city setting. Hi Kim, I've never seen a one room school at a fair, but recently I visited a one room school in the ghost town of Calico, California.